By Zach W On April 4, 2016 · 1 Comment · In Election 2016, Local Politics, Those Kooky Conservatives! Chris Wiken really really wants to beat incumbent Alderman Terry Witkowski in the 13th aldermanic district. Wiken, a conservative who only recently moved into the district after decades spent living anywhere but the district, recently sent out a mailer to residents implying he had the endorsement of Archbishop Jerome Listecki of the Milwaukee Archdiocese. It’s highly unusual for a religious leader to make such a blatant statement of support (i.e. an endorsement), but apparently Chris Wiken’s mailer is highly misleading, as a spokesman for the Milwaukee Archdiocese has issued a statement making it clear Archbishop Listecki did not authorize the use of his image or any statements of support on Chris Wiken’s campaign mailer. 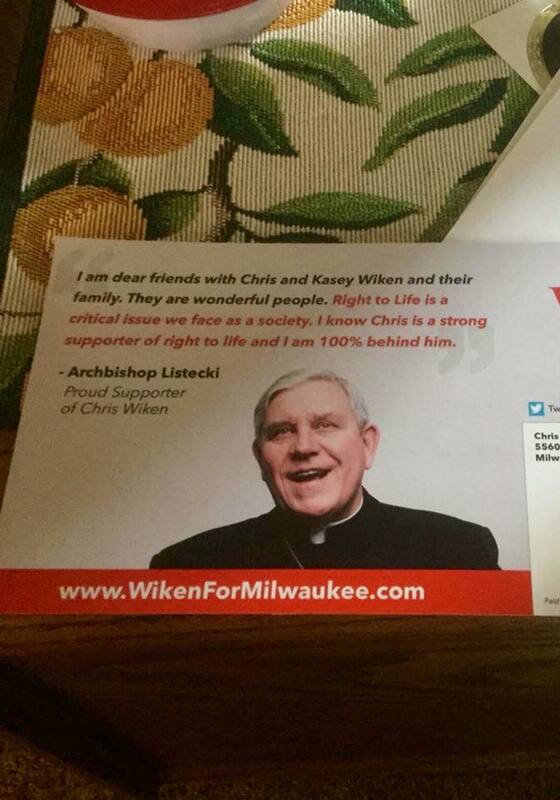 “Archbishop Jerome Listecki’s representation on Chris Wiken’s political campaign flyer, including quote, picture and title ‘Proud supporter of Chris Wiken’ underneath Archbishop Listecki’s name was neither approved by Archbishop Listecki nor the Archdiocese of Milwaukee for use,” Grau’s statement said. “The Archbishop was not aware of his representation on this political flyer until this morning, nor was he contacted for approval/awareness of any of the content related to him on it. For theological and legal reasons, Archbishop Listecki did not and would not approve any representation as Archbishop for campaign use,” Grau’s statement said. When asked about his campaign’s misleading mailer, Chris Wiken tried (laughably) to say that his mailer was not intended to imply the Archdiocese/Archbishop was endorsing a candidate. “In no way did we intend to imply that the Archdiocese was endorsing a candidate and we did not explicitly or implicitly imply that they did,” the statement said. Since Wiken’s campaign deleted my comment on his Facebook page, I’ll just note here what I noted on Facebook – that while I don’t presume to be an expert on all things relating to political campaigns, I do know enough to know that it’s considered poor form to use someone’s image and words to imply an endorsement without that person’s consent. The fact that Chris Wiken thought he could get away with using the Archbishop of Milwaukee’s image and words to imply his campaign had the Archbishop’s support/endorsement speaks volumes about him. A copy of that mailer actually hit my door too…I was surprised to see the archbishop on it and such a blatant quote of support…but I was also surprised that the lit I got was addressed to the previous occupant who hasn’t lived here for three years and this address is solidly in the middle of the 14th Aldermanic district. Someone’s campaign staff is out of control.